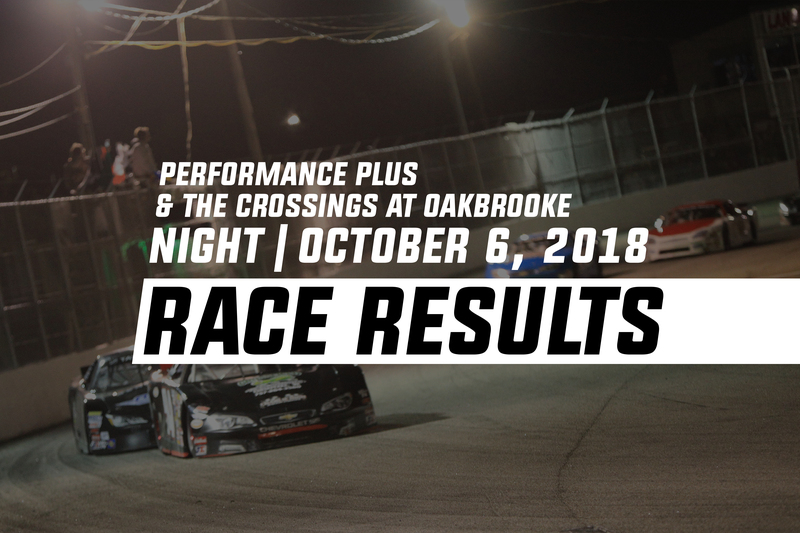 Hampton, VA (10-06-18) After a lengthy break in the 2018 race season at Larry King Law’s Langley Speedway, several race division track championships were still in play and would go down to the final week to decide. 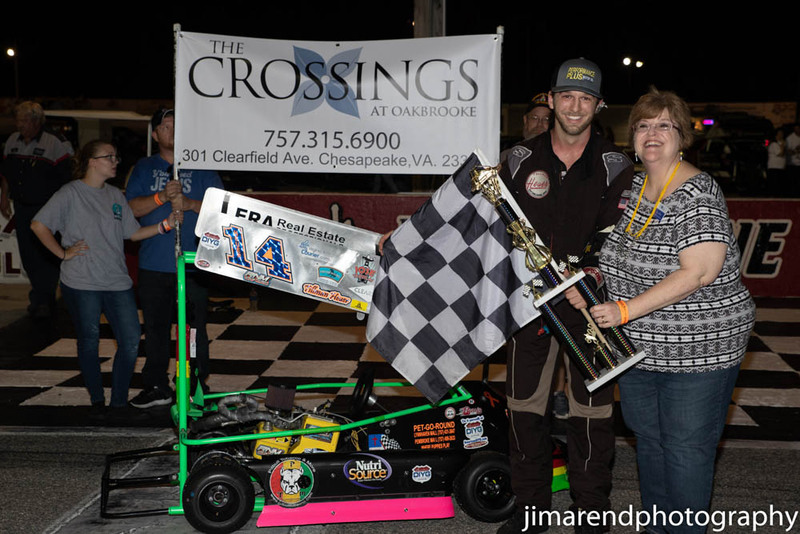 Featured on the evenings race schedule were the ERA Realtor Winged Champ Karts with Aaron Leach firmly in control of the division. Riverside Paper Pro Six division were in action as Travis Wall looks to clinch in the series. 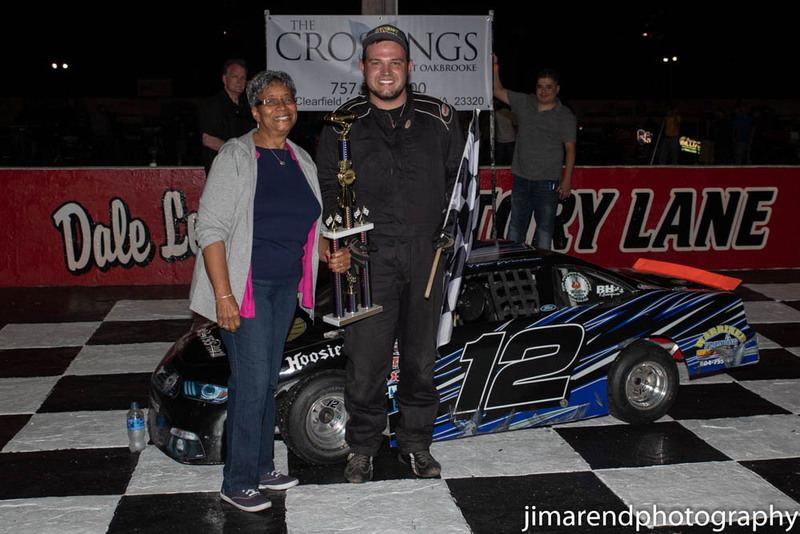 Carroll’s Automotive UCar series was back as well with Austin Davis starring at a track championship. In the always competitive Old Skool Video Games Super Street division, Dale Nichols will look to close out the season with a championship. But would fellow competitors Randy Akers and Sean Calway have something to say by the end of the night? Also, in action on this much anticipated evening would be the Larry King Law Modifieds. 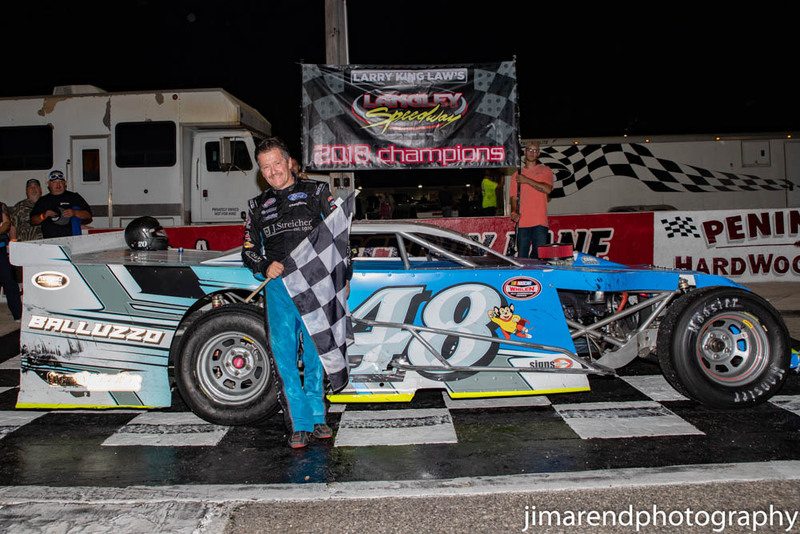 Though the division championship is wrapped up by now ten time series champion Shawn Balluzzo, the hundred lap event would be sure to bring out the best racing as the season comes to an end. 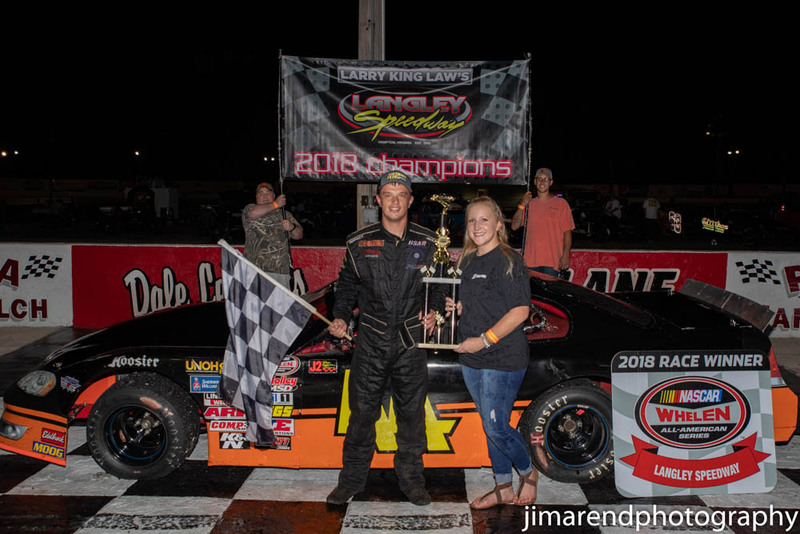 Welcoming back to the speedway were The Virginia Mini Cup series making for a thrilling night and the crowning of the season Champions. Here’s a recap of how it all went down. ERA Realtor Winged Champ Karts 20 Laps: Aaron Leach picked up the Winged Champ Kart pole in the afternoon qualifying. His lap at 22.965 seconds beat out Tillman Heuer’s effort but deserving of row one. Garry Osbourne, Chris Bechtel and Jordon Wharton were qualifying’s fastest. 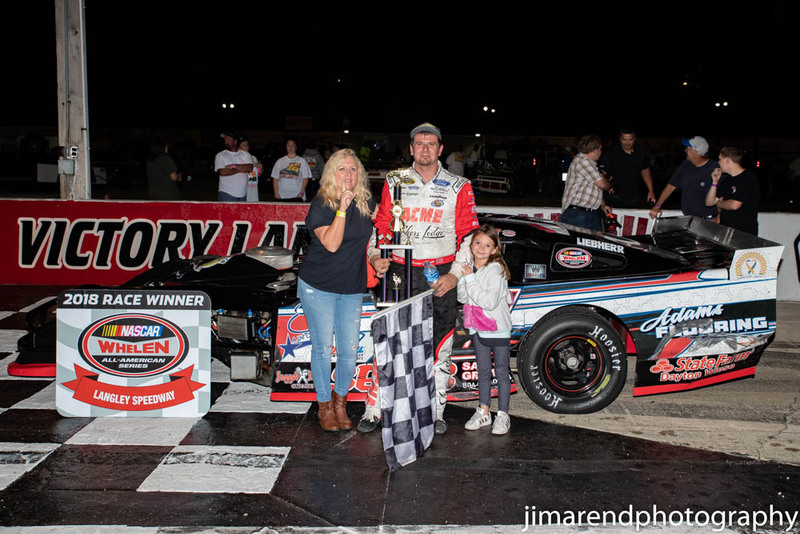 Green flag was shown to the field and series points leader Aaron Leach easily secured the point. In tow nose to tail would be Garry Osbourne, Tillman Heuer and soon joining in the fray would be David Millard with Matthew Leach. After a brief caution to the event, the pole sitter would win the single file restart as Heuer would continue to chase. By the halfway, Aaron Leach and Tillman Heuer had worked their way from the rest of the field as a two car tandem. David Millard along with Robert Pellek would hook up together to chase down the leaders but could not close in. Then a move for the lead as Tillman Heuer gets by Aaron Leach and from there, he’ll get the race win. Heuer from Victory Lane, “Finally got a win at my home track, it feels so good, I can’t believe it. I’ll wait to the end of the season anytime to get a win so it happened at the perfect time”. The 2018 Winged Champ Kart Champion Aaron Leach added this, “Yeah, Tillman looked out a lot for me this season and I already told him I owe you something terrible. Like I said, Tillman looked out for me and when we started to catch the three lappers, I decided to go ahead and give it to him because I knew we could get back locked up. He earned it, can’t thank him enough for everything he’s done for me this season and the championship, it’s been a long time coming”. Virginia Mini Cup Twin 25’s: Johnny Shonk took the Mini Cup series pole sporting a lap at 20.150 seconds. Tyler Warriner was up to the task but just short of the pole speed qualifying in second. Jim Grady Jr, Bubba Henly and Dean Johnson would go three through five to start the race. Green flag waved and the pole sitter Shonk would lead lap one. Giving chase would be Tyler Warriner followed by Jim Grady Jr, Justin Herndon and Bubba Henly. The field quickly fell single file as the leader enjoyed the early five car length lead. Laps later, Warriner knocked off two lengths of the race leaders lead and seemingly the fastest car on the track. Halfway saw Warriner there and just behind Shonk in what looked to be a battle for the race lead but then the first race caution. After the reset, Johnny Shonk pulled hard to secure the lead but back would come Tyler Warriner to take the race lead. But Shonk didn’t give in, final lap, Shonk would try the outside but couldn’t get it done, Tyler Warriner wins. Warriner had this to say in Victory Lane, “Yeah, I was just trying lines, I was trying everything to find some speed in that thing. I just gotta thank Bubba for setting up this car and everything he does for me. Especially my dad, he is everything to me, he supports my hobby and is my number one fan”. In the second race feature, race winner Tyler Warriner elected to start in the rear for max points in the division. Top spot would then be occupied by Johnny Shonk when the green flag flew and by turn two, Shonk secured the point. Jim Grady Jr was an early mover as was the earlier race winner Tyler Warriner showing fourth in the early laps. Then positions two through four came into play when Warriner and Herndon battled with Heardon taking second. But because of that battle for position, Johnny Shonk was getting away. 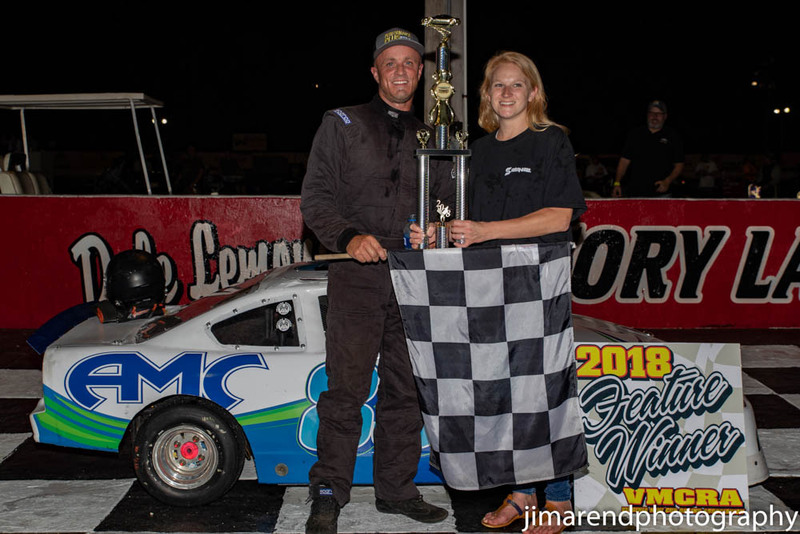 Meanwhile, Heardon, Warriner and Johnson would all go nose to tail once again second through fourth but it was Johnny Shonk with the race win in the Virginia Mini Cup nightcap. 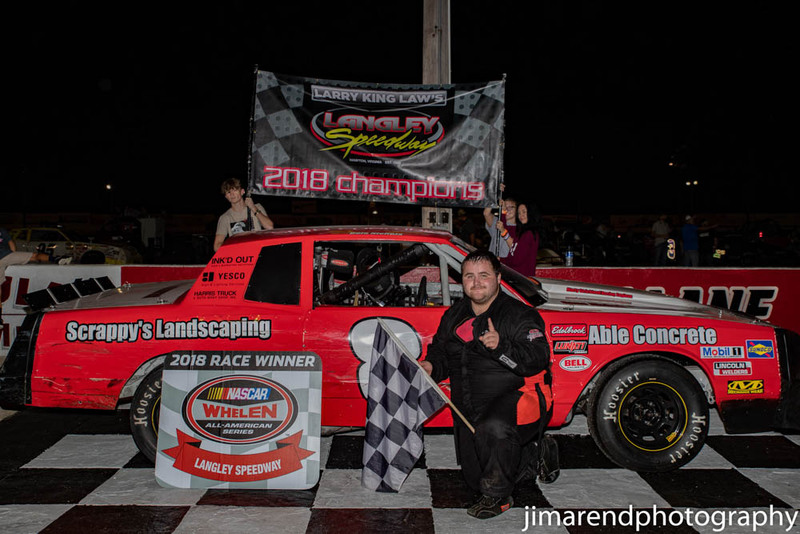 Johnny Shonk had this to say, “Like to thank all the fans who came out to Langley, Jim Grady Jr, Jim Grady Sr, without them, I couldn’t run up front”. Old Skool Video Games Super Streets 40 Laps: Dale Parro earned the series pole by posting up an 18.594 second lap keeping Renno Marchetti to his right in a share of the front row. Jimmy Adkins, Randy Akers along with Nick Sample were the five quickest in Super Street qualifying. Green flag was given and the pole sitter Dale Parro would lead lap one. Marchetti from the two spot would take a peek or two in sizing up the leader but soon backed off to settle for second. What began as a fairly tamed beginning soon saw the races first caution when the cars of Sample, Weeks and Roberts got together. At the restart, the race saw Parro once again maintain the race lead, Marchetti once again tries to force the leader into a mistake but nothing doing but once again, we were back under caution. With the green back in the air, Parro gets another great restart but Renno Marchetti gets one of his own to take the race lead from Parro. Sean Calway climbs into the top three with his restart as well as the halfway draws near. Meanwhile, back at the front, Dale Parro would close back to Marchetti’s bumper and searching for a way around. Beating and banging, Parro was all over the race leader, side by side, finally Parro gets by Marchetti. But back comes Marchetti and gets into the back turning Parro to bring out the race caution. Marchetti would have to start at the rear, penalized for rough driving, and handing the lead to Sean Calway. 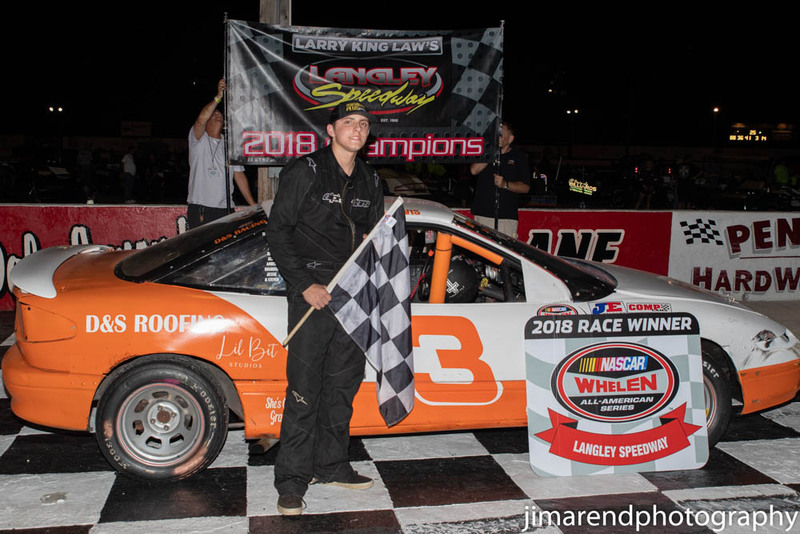 But the action didn’t stop there, on the ensuing restart, Randy Akers would get turned by the bumper of Landon Abbott setting up a ten lap shoot out. With the green waving, race leader Calway and pole sitter Parro would battle side by side for the lead. Marchetti would want in as well with four laps to go as Dale Parro reclaims the lead. But in a three wide move, Marchetti sneaks inside and spins. The action didn’t end there, on the next restart, race leader Parro goes around setting up yet another caution to the race. Yielding one more caution before the checkered flag, Sean Calway in a crash fest wins the season finale. Calway in Victory Lane, “It was door to door racing, its really competitive, these guys are super fast I was pretty lucky to be out there with them. Congratulations to the eight car for winning the championship, I was super excited to win here today”. Dale Nichols was crowned the division championship, his comments on the season, “Yeah we really put it together, I just can’t thank everybody enough, everybody on the crew, all my sponsors, wow! Its crazy, I race against Randy, Sean, they’re all tough, you got to be on your game, it’s a blessing to run up here with them. Carroll’s Automotive UCar 25 Laps: Charlie Bryant Jr notched down the UCar series pole with his lap set at 18.931 seconds. Michael Waters would get the two spot on the grid followed by Brandon Wood, Tillman Heuer and Austin Davis. With the green waving in the air, the front row starters elected to start the race from the rear. Once everything sorted itself out, Tillman Heuer would be the early race leader. 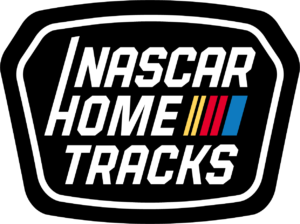 But the speed of Charlie Bryant Jr, Michael Waters could not be denied and by lap six of the event were shown one and two on the track. After a brief caution, both Bryant and Waters would continue to show the way. Tillman Heuer wanted in on the action in third but soon fell off and dealing with Austin Davis for position. But back up front, the battle for the lead continued as Bryant had it, Waters wanted it. Final laps saw Michael Waters try everything to find a way around the leader but it was not to be. Charlie Bryant Jr win the UCar feature with Austin Davis winning the division championship. Bryant Jr in Victory Lane, “These two cars are so close, when one guy gets out in front its almost impossible to pass without doing some damage. He run me clean so I was happy about that”. Austin Davis reflected on his 2018 UCar Championship, “I came into this season thinking all I wanted to do is win rookie of the year, that would be nice, but a track championship? It’s awesome, I don’t know, I’m so blessed to be here, it’s crazy. The most person I wanted to thank is my dad, he’s done everything for me. He’s the one who works on it, everything, I wouldn’t know what to do without him”. Riverside Paper Pro Six 30 Laps: Travis Wall had the hot wheel in Pro Six qualifying with a lap at 17.419 seconds to earn the race pole. Tyler McLaughlin’s speed would find himself starting second followed by Eric Schaffer, JB Sipe and Jared Clarke. Green flag was shown to the field and like a rocket, pole sitter Travis Wall mounted up a six car length lead by lap three of the feature. Eric Schaffer was on the move, taking the second from Tyler McLaughlin who soon came to pit road with troubles. JB Sipe was looking sporty early in the race in chase of Schaffer for second. Halfway into the race and so far, caution free but race leader Travis Wall had checked out. With a half a straightaway length lead, second place Eric Schaffer needed a caution for a shot at the race leader. But the race would go caution free and Travis Wall would motor on for the race win. Travis Wall also would become the 2018 Pro Six division champion. Travis Wall from Victory Lane, “Man, what a good season we’ve been having all year, coming out here with almost a brand new car for us. So much work we did in the off season, and just to come out here off the bat, little bit of motor issues and got that straighten out. We went to a real safe set up, went out there, won the race and won ourselves a championship”. 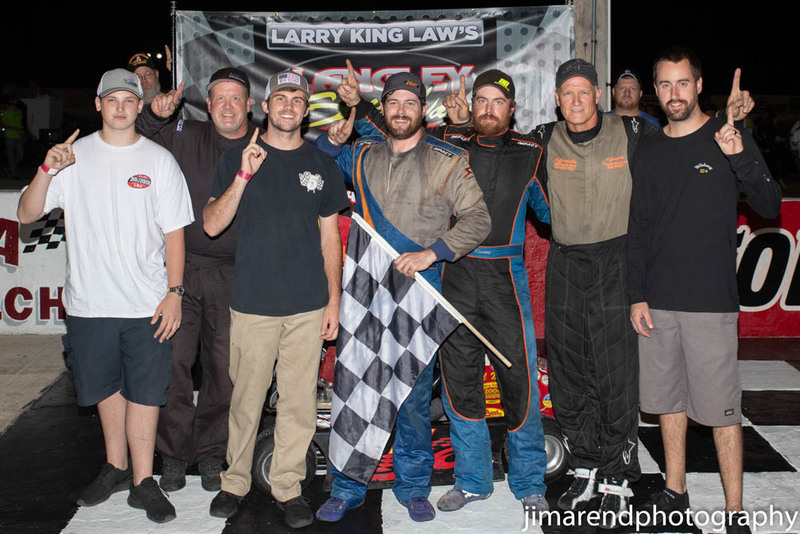 Larry King Law Modifieds 100 Laps: Shawn Balluzzo knocked off long time rival Jimmy Humblett from the pole but posting a 16.478 second lap. Jimmy Humblett however, earned his share of the front row just thirty thousandths off the pole speed. Matt Carter, Bubba Johnston and Jamie sample were the top five in qualifying. Green flag was given to the grid and pole sitter Shawn Balluzzo would take off. Jimmy Humblett would give chase but had nothing for Balluzzo early and elected to ride in the first half of the race. On back, Matt Carter and Bubba Johnston were battling for third with DJ Valente up to fifth. Wasn’t long before the race leader caught the tail end of the field and began picking them off one by one. With a quarter of the race complete, Balluzzo was on a torrid pace and showing a full straightaway length lead over the closest competitor. With Balluzzo on the way, the field needed a caution and just like that, the field got one courtesy of Chris Humblett for his spin. With the field bunched back up, the green flew once again and Shawn Balluzzo continued to lead. Matt Carter would briefly take second but back would come Jimmy Humblett to retake the spot. But still out front and in the clean air, Balluzzo lap after lap distanced himself away from Humblett. Nearing the halfway, Danny Harrell made his way into the top five with Bobby Gery a car length back and seemingly, on the move. But back up front, Balluzzo caught Andrew Fortin who refused to allow the leader to get around to go a lap down. The battle erased the race leaders lead and likely a frustrated Shawn Balluzzo. Then the lap sixty five caution waved which allowed the cars to top off race fuel and minor adjustments. Green flag waved for race leader Balluzzo and from the outside came Matt Carter to take the lead. But the spinning car of Jimmy Humblett negated the restart and Carter’s brief race lead. Green flag waved once again and a much better restart for race leader Shawn Balluzzo. Matt Carter, Bubba Johnston, Danny Harrell and Chris Humblett who were the top five did a much better job of not letting the leader get away as well. After yet another quick caution to the race, things went bad for race leader Balluzzo as the ensuing restart, Balluzzo could not get going and unsure if it was from contact. None the less, Balluzzo gets into the wall for yet another race caution. Assuming the race lead would be Matt Carter and would be money on the restart in securing the lead. Johnston and Harrell were equal to the task, chasing the race leader in second and third. The race would then go through a series of cautions which allowed Jimmy Humblett to work his way back into second. Shawn Balluzzo would benefit as well and was on the move. Final laps saw Balluzzo work his way back to second and chasing race leader Carter. But it was Matt carter outlasting the charge and would go on to win a caution filled Modified race feature. 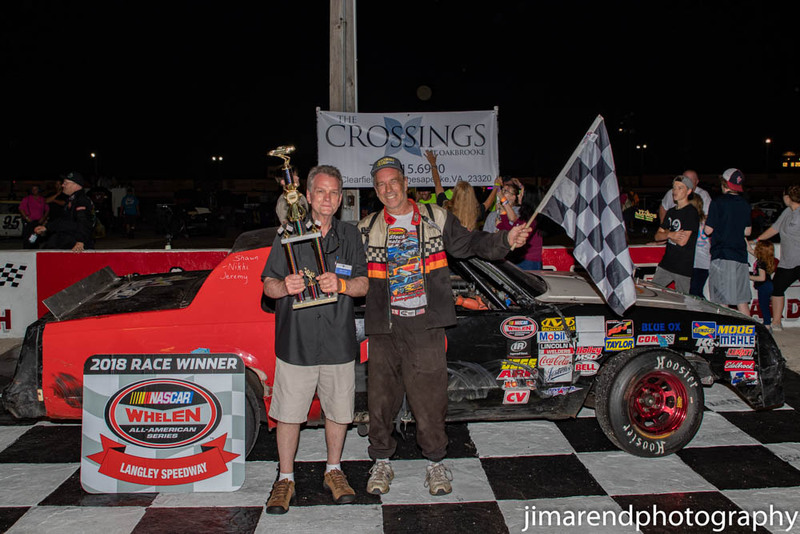 Shawn Balluzzo wins his tenth Modified track championship. Matt Carter in Victory Lane, “Yeah man, this feels great! I pretty much just let the forty eight and the eleven go, I had a plan to just ride up to about lap eighty and then it was on. This field is really good, this team has worked its butts off this year. We had a lot of ups and down, to be able to put this thing in Victory Lane for this race, it means a lot”. Shawn Balluzzo spoke about his tenth championship, “Its all the guys this year, everybody worked really hard on it, I showed up for race and that’s about it. We really don’t have any sponsors, really want to thank my wife, been right there with all the stuff with Bryce and the race car”.